What’s not to love about Lavender! Besides its visual beauty, it can be used for so many things. We include it in the formulations for our “Lavender Collection.” Inhaling its fragrance brings relief from the stresses of our daily lives. The soothing properties of this amazing plant are a must in our lotions and creams. A quick spritz of our Lavender mist can uplift the spirit while bringing about a restful nights sleep. We can even cook with it! The dried flowers are in the classic French “Herbs de Provence” culinary herb blend. Here in Montana the first harvest is usually in late June or early July, and sometimes we can harvest again in late September. How are your seedlings doing? Hello students and fellow gardeners! I thought I would check in to see how your seedlings are doing since our class! The weather has certainly been lovely, and the sun has been shining bright so your babies should have started to grow. If you planted large seeds like cucumbers, they should have popped up in 7 to 10 days. Smaller seeds like tomatoes and peppers always take a little longer, and herbs are typically very slow. Watering is always a challenge depending on the air temperature and whether they are in direct sun or under lights. You don’t want them to dry out, but you also don’t want them to drown. Once up, you can begin fertilizing with a weak dose of fish emulsion. I use 1 tbsp per gallon of water every week until transplanting out into your pots or garden. You can either water into the soil or spray onto the plant (foliar feeding). I am planning on offering another class on transplanting and direct seeding into your garden sometime in the latter part of May, but will wait to see what the weather is going to do to confirm dates. Let me know If you think that would be of interest and helpful to you. Have you started any new seeds? This is a photo of peppers that I started on March 9th. By early June they should bed ready to be transplanted out. Now is a good time to start cabbage, broccoli, cauliflower, cucumbers, lettuce, spinach, chard and kale. All of these can be transplanted out into the gardens when it is still cool, as long as it doesn’t freeze. It’s also not too late to plant potatoes. Seed potatoes are available now at all of the garden centers. You don’t have to grow them in the ground if you don’t want to. They grow great in large whiskey barrels or wire cages. I would love to hear from you regarding your seedlings; I want you to really fall in love with gardening and growing good food! That means you must have fun and be successful in your process. I am here to help, so call or email with your questions. Some of you may not have the time or space to grow enough food for you and your family or may only want to grow a few tomatoes and herbs. That is just fine, too! Just being outside playing in the dirt and watching the magic happen can be such a joy. It’s the ultimate stress buster! Don’t forget that you can always sign up for my CSA to supplement what you are already growing for this summer season. I am taking applications now and still have plenty of room for new subscribers. You can visit my website to see the information on how it works and also the registration form. I would also appreciate any referrals that you can send my way. I have a passion for educating others on the importance of sustainability in building strong communities. I can only continue my work with your help and support. Please drop me an email or give me a call to let me know how you are progressing with your garden planning and your veggie starts. I would love to hear from you and offer help whenever you need it. Kate’s Garden & CSA ~ Early registration is now open! The 2015 garden season is just around the corner so I thought I would let you know what is happening here at Kate’s Garden! Seeds are already germinating in the greenhouse, fruit trees have been pruned and all of the beds are ready to plant. I am getting pretty excited and chomping at the bit to put the first seeds and transplants in the ground! I won’t be putting anything out until at least late April early May, depending on the weather, but I can hardly wait! My farm is located in the Billings Heights and sits on 1 1/3 acres. I have always been an organic gardener, but am not certified organic. I have a passion for growing vital, healthy food. Ever since I was a little girl I loved playing in the dirt! Learning how to use our earth’s bounty to produce all that we need to live well has been a life long mission of mine. I have been an eager student at learning how to grow food, make medicine and nurture my soul. I am going to get up on my soap box now, so please bear with me! It has become quite evident that our “business as usual” industrialized food system no longer works for us. We are now seeing the negative impact on our health and environment as a result of the high use of chemical fertilizers, insecticides and herbicides in industrialized farming. Our bees are dying, the Monarch butterfly is becoming extinct and our soils deplete of nutrients; not to mention the quality of the air we breathe and contaminated water in our rivers, streams, lakes and oceans from toxic run off. We are becoming aware of the fact that eating fresh, nutritious food is one of the best ways to maintain good health. “Know your farmer” is not just another catch phrase. It is a growing movement to create strong, healthy communities. Our farm lands are being sold to big business because the land is worth allot of money and yet the farmer struggles to make a decent living. There is something wrong with this picture! When you support a local farmer, or any local business for that matter, you build a personal relationship….there is a face to see and a handshake to feel. There is warm conversation and maybe even a new friendship. I am reaching out to you now, as I need your support In order to continue farming and growing my business. This year I have taken a giant leap of faith in lowering my CSA subscription price and offering 1/2 shares. It is my hope that this will encourage you to join this year. It’s really is a benefit to us both. I am able to continue doing what I love in sharing my gifts through farming and education, and you have the opportunity to experience the farm and eat healthty food (recipes included). To see all of the information on the cost of this year’s CSA, how it works and to register, please visit my website. You can also send an email (katescents@bresnan.net) or give me a call (245-9128). I would love to hear from you. It’s been out of the fry pan into the fire this past week. The days have been so hot that Barb and I have found it callenging working in the garden in the afternoons. With both of us now in our 70’s we just can’t take the heat like we used to. That being said, the summer squash and peppers are loving it and really starting to grow. I was really worried there for awhile, as they just were just sitting there. This time last year we were almost ready to harvest the first of the zucchini….not so this year. With the cool nights of the past few weeks, they just were not liking it! Everything is looking pretty good out there right now. The flea beetles, which were quite bothersome in the early spring last year, are just now starting to show their nasty faces. It’s a good thing that this is the final harvest for the braising greens, as the beetles love those crops! This week will provide you with the last of the spring peas, beautiful heads of cauliflower, broccoli florets, radishes, swiss chard, a colorful mix of heirloom beets with their tops, baby carrots and, of course some herbs. I am really pleased with the cauliflower. In past years I have found it difficult to grow them perfectly…similar to the broccoli. But this year I think I was blessed. They look spectacular. Be sure and top your carrots before storing them. We leave the tops on because it is a great way to bundle and present them. You can either put them in a zip lock bag, or store them in water for crisp snacking. The beet tops are considered a green. They can be braised, steamed, added to stir frys and Thai curries, or roasted with other veggies in a 450 degree oven. The beets can be steamed, boiled, pickled and I even like them grated raw into a green salad. If they are boiled or steamed, the skins slip right off. Otherwise you may want to peel them. I actually like the peels….just like carrots, as long as you scrub them good. I am excited to announce that I will have organic, free range eggs available here every week for you to pick up. My friend Marlene Wilkin lives just down the road on Independent Lane. She grows heritage birds and her eggs are wonderful. I thought it would be a great way to introduce you to another local producer and give you the opportunity to cross one more thing off of your grocery list. The eggs will sell for $3 a dozen. Don’t forget to bring your bags or boxes! It’s finally beginning to feel like spring! The meadowlarks are singing, the robins are gathering grasses and leaves for their nest building and the male pheasants are strutting their stuff! The sun’s warmth has once again returned and brings forth the promise of an abundant, vibrant garden season. Thank you all for joining the CSA this year. I am excited to see and experience the miracles that always present themselves each year as we travel through the spring, summer and fall garden season. Just a quick update to let you know how things are going here in the greenhouse and garden. The warmer weather the last couple of weeks has allowed Barbara and I the opportunity to move the tomato and onion seedlings from the greenhouse out into the window boxes to harden off before we plant them into the garden. I was bold and even transplanted the seedlings of lettuce, Napa cabbage, broccoli, cauliflower and scallions out into the garden. I am trusting that they can handle the temperature fluctuations so that we can provide you with some early crops. We also direct seeded beets, radishes and spinach. As you can see we are getting ready for a bountiful CSA season. The greenhouse is bulging at the seams with the rest of the seedlings we have started. There is not 1 square inch of room on the tables for more! I need to get things outside soon, so that I can start more plants. This week I will be harvesting the lettuce and spinach that is growing in the ground and send it to Market Day Foods in Bozeman. It is really nice to have another place to sell my produce. I still have a few more openings available for this season’s CSA, so if you know of anyone who would be interested, please let them know. I was hoping for 16 this year and we stand at 11 as of today. I will probably place an ad in the Billings Gazette this week. 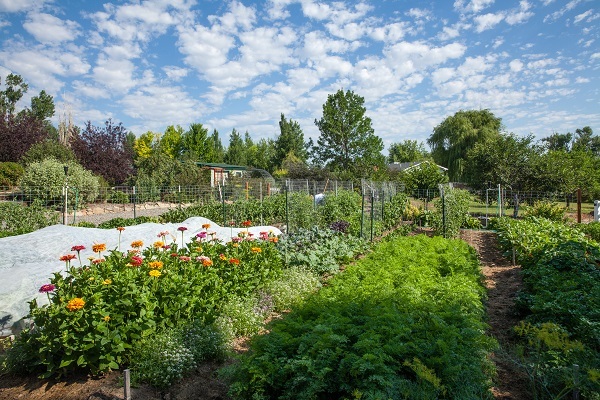 I had hoped that I would have had a greater response from the article on my garden in the Yellowstone Valley Woman magazine, but sadly that has not been the case. I have planted extra seedlings of tomatoes (early small, large slicers, both yellow and red, and several different colors and shapes of cherries), peppers (bell, jalapeno, habanero, ancho/poblano and sweet Italian) and eggplant that I will have available for sale for those of you who would like to have a few plants at home. They are organic, healthy heirloom plants and in 4 inch pots. They will sell for $3.75 ea. Let me know soon if you are interested and I will save some for you. I also have beautiful large, hardy lavender plants that have been growing in the greenhouse all winter. The are just starting to bloom. They are ready to plant now. They are hardy here in our zone and are plants that have self seeded from my lavender that has been growing here for over 10 years, so they are well acclimated to our environment. They will sell for $5 ea. There is still time to let me know if you are wanting to can or pickle this year. The canning baskets for tomato sauce, salsa and cucumber pickles need to be ordered soon, so that I will have the available produce growing for you. You may want to consider fermenting some of your veggies this year. I made sauerkraut last fall from some of the “not so perfect” cabbage I had left from the garden, and it turned out great. I am planning on doing allot more fermenting this year, as it is so good for you, and it is so easy to make. You are more than welcome to come by for a visit any time to see the garden and greenhouse. It will be looking better, greener and more lush in a few weeks. Give me a call if you do. Just a reminder that for those of you who have not paid in full for your subscription, your final payment is due by May 15th. Here is a great recipe for taking advantage of the baby spinach that you find in all of the markets right now. It’s quick, easy and tastes great. Enjoy! With appealing Mediterranean flavorings, you’ll feel like you’re vacationing, not watching your waistline. For a non-veg variation, toss in some grilled shrimp or chicken breast. 1. Cook the pasta according to the package directions. Before draining, scoop out 1/2 cup of the pasta-cooking water and reserve. Drain the pasta and return it to the cooking pot to keep warm. 2. Meanwhile, in a large, nonstick skillet over medium-low heat, combine the oil and garlic. Cook for about 2 minutes, or until the garlic is soft and fragrant. Do not brown. Add the tomato and cook for about 4 minutes longer, or until the tomato starts to soften. Add the spinach and cook, tossing, for about 1 minute more, or until wilted. Stir in the lemon juice, olives, capers, pepper, and salt. Reduce the heat to low. 3. Add the tomato mixture to the reserved pasta and toss to coat. Add a few tablespoons of the reserved cooking water, if needed, to moisten the pasta. 4. Serve sprinkled with cheese.